The Missouri Boys State Memorial Trust (“The Trust”) was created in 1982 to ensure the financial future of The American Legion Boys State of Missouri program (“Missouri Boys State”). Originally created as a “rainy day” fund, the primary mission of the Trust is to secure the financial viability of the Missouri Boys State program in perpetuity. Along the way, The Trust has also provided financial assistance to a few select areas of the program that are deemed important to the success of Missouri Boys State. In addition, The Trust assists with registration fees for eligible citizens who otherwise wouldn’t have the means to participate. The Trust has provided funding for college scholarships for outstanding participants and volunteer staff. The Trust also provides financial support for various special projects, which enhance the Boys State experience. 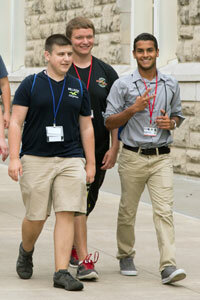 During the week of Missouri Boys State, citizens participate in a wide variety of educational and recreational activities and hear inspirational talks from both state and national leaders. Many of the nationally known speakers who appear at Missouri Boys State are partially funded by The Trust. Missouri Boys State provides young men with a broad understanding of the privileges and responsibilities of citizenship and a better understanding of how our government works. It is expected that each citizen will take the ideas and knowledge he has gained through Missouri Boys State and apply them in his own high school and community. To make a donation electronically, please use our online donation form. Copyright © 2008 The Missouri Boys State Memorial Trust, Inc.